If you normally use a desktop client like Outlook, Windows live mail etc to access your email then what happens when you are away from your home/office? How do you access you email from a remote location? or from another computer? Can you access your old emails remotely as well as send and receive new ones? Important Note: Because of the way corporate email is setup these instructions do not apply for corporate email accounts. See questions and answers below. Regardless of what email client you use you should ensure that you access your email using the IMAP4 protocol and not POP3. If you presently use POP3 then you will be able to view new emails but not old emails as they have probably been downloaded to the email client and home. You should consider moving from POP to IMAP4. 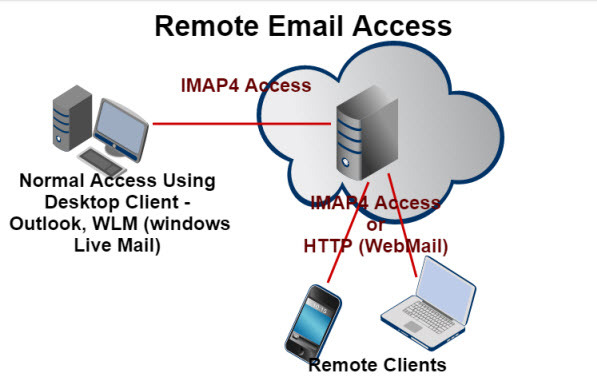 Because IMAP4 stores all email,sent and received, on the email server you can access your email from any location and using different email clients. You can use a smart phone /tablet as the remote client and an email App. The Email App should be configured to use the IMAP4 protocol. Is should also be configured to use SSL for IMAP and SMTP. Note: Some Apps like the Gmail App may not ask you for a protocol, and will use IMAP or HTTP by default. If you can receive email but not send email from a remote location it is probably because your email provider has restricted SMTP connections by IP address. Fortunately Gmail,Yahoo Mail and Hotmail are easy to access remotely as they are all designed to be used with a web browser (webmail(. Gmail, Yahoo Mail and Outlook.com (hotmail) will only allow access using a secure connection (HTTPS). If you are accessing a mailbox on another email provider then you should ensure that it uses HTTPS. Q – How do I access my Gmail account,Yahoo account etc from another Phone? Q- Can I access my Work email from Home? A- Not completely . Make sure you don’t get the browser to remember passwords, and I would also change the account password when you return to a trusted computer. Q -Is it safe to access email using POP3 or IMAP4 over public Wi-FI? A- No it isn’t. If you use POP3/IMAP4 over public Wi-Fi then you should use an encrypted connection using SSL. A- Yes provided the webmail access uses SSL. Q- Is accessing using the GSM network more secure than using public Wi-Fi? A – Yes it is. 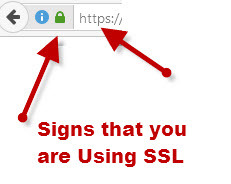 A- In web mail you will see a small padlock icon, and the web address should start with https. There are a variety of ways of remotely accessing your email or when accessing your email using another device. Generally the most common option is to use a mobile/phone or tablet when travelling and a PC/Laptop when at the office/home. Regardless of which methods you use make sure you are aware of the security considerations and always use SSL to encrypt your email connection.